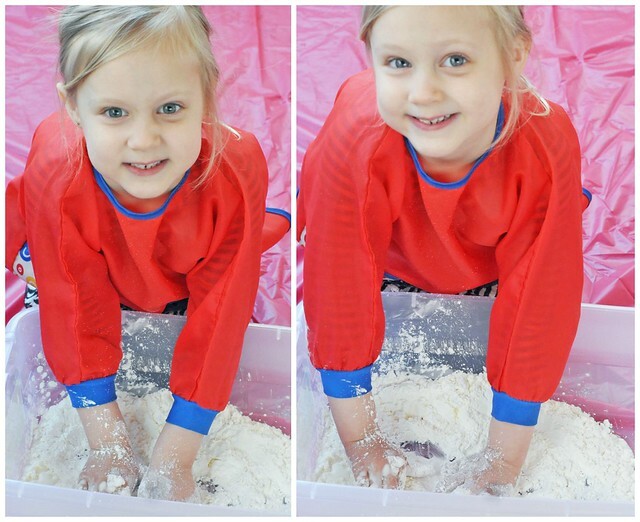 Our Five Ring Circus: Getting Goop-y! 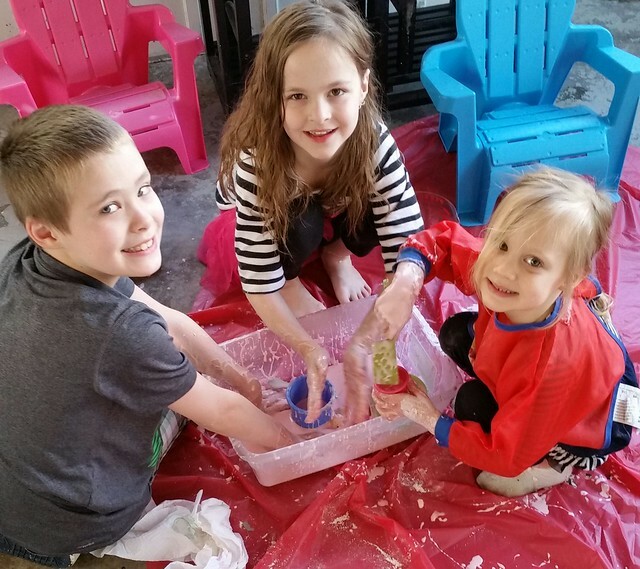 When Dylan and Lexie were little, I did so many learning activities with them! I had the gift of time, because I didn't have older kids to care for. Shortly after Lily was born, Dylan started first grade and Lexie started Pre-K. I did have many hours alone with her, but she was just an infant. She spent most of her time napping and hitting milestones, and the rest of our days were filled with running Dylan and Lexie to and from school, and going to their many activities. As they all grew, time became even more scarce. When Lily was only 17 months old, we found out Liam was on his way. It was a struggle to even make it through the day with severe morning sickness that lasted until the day he was born. I managed to take care of the kids and meet their every need, but it was incredibly difficult. Even though I didn't have much time for hands on learning activities with Lily in the 2 short years before her brother was born, she had a full social life and got to experience so many different things. Her childhood was not lacking in any way! When I registered Lily for Pre-K in February, it hit me like a punch to the stomach that my time left with her at home was very limited! I really wanted to make my time with her count, so I decided to start choosing one activity a week to do with her. I love to involve her in the decision, so I give her two activities to choose from, and go with what she chooses. 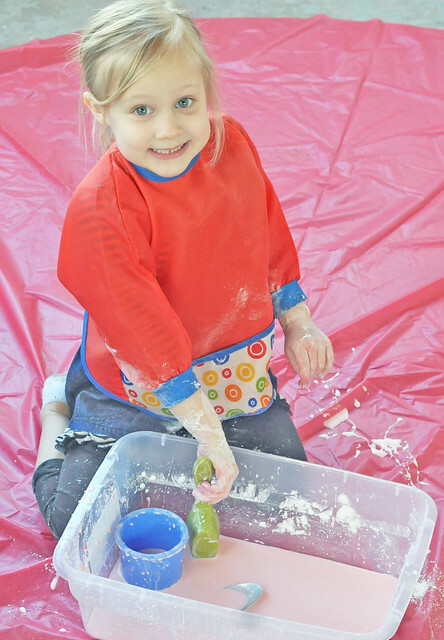 I was so excited when Lily chose making Goop (or Oobleck) for this week! 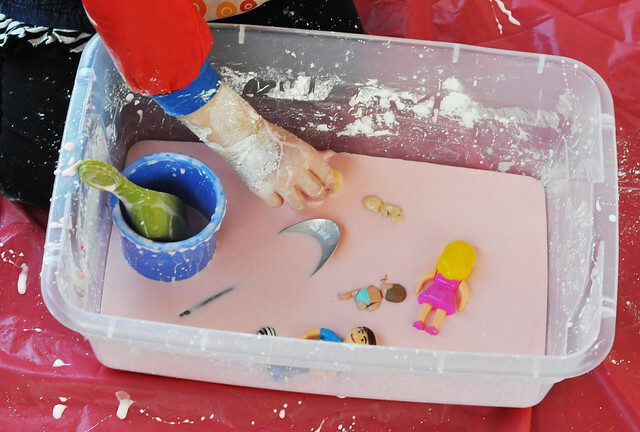 When I was in preschool, my absolute favorite activity was playing with Goop in the sensory table. I couldn't wait to share that experience with her! 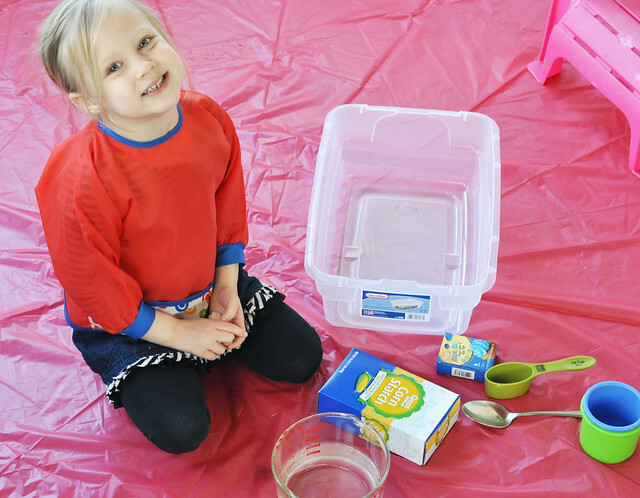 Making Goop is really easy and really inexpensive! 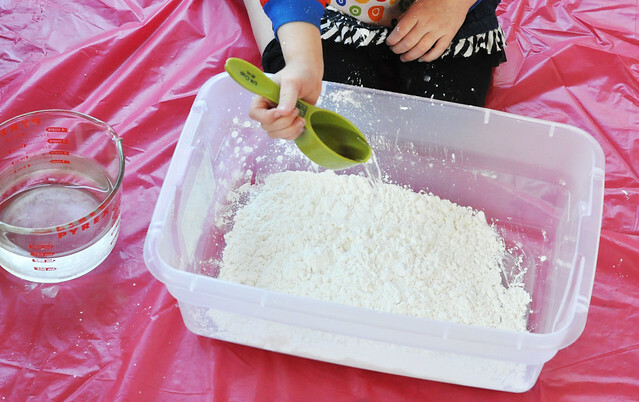 All you need is a 16 oz box of cornstarch (only 99 cents), water, food coloring (optional), and a container to put it in (a $3 storage bin with a lid is perfect)! 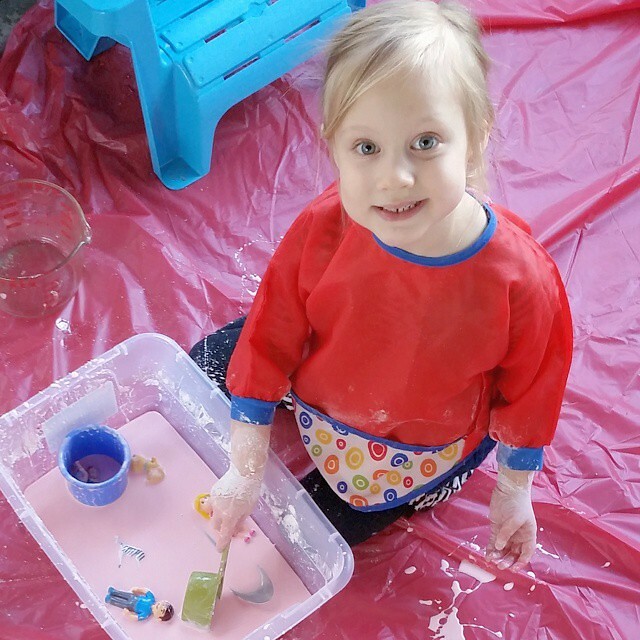 Gather up a few spoons, strainers, cups, and toys for scooping, pouring, and playing. If you will be making it indoors, I HIGHLY recommend a large, plastic tablecloth to put under the container! 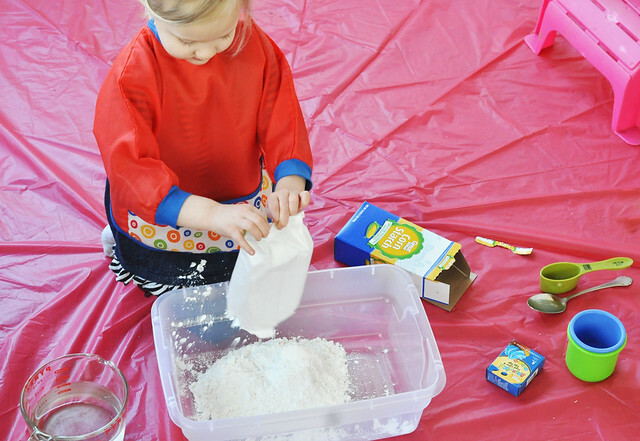 This is a messy activity! It is easy to clean up, though. 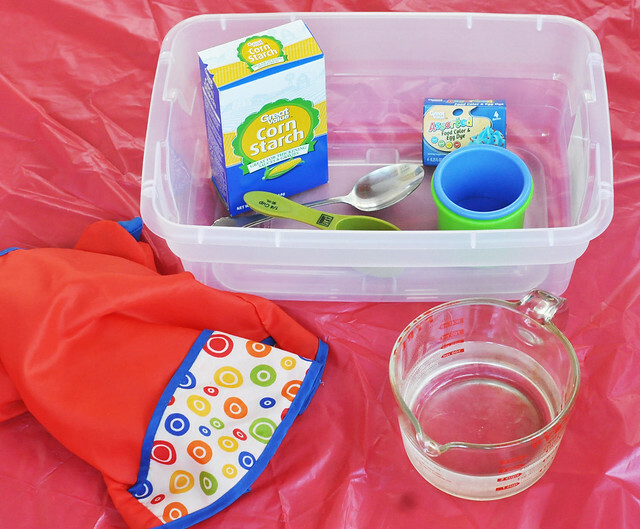 It rinses easily off of toys, utensils, and clothing. I originally planned on making the Goop outside, but the rain kept us indoors. Thankfully, we didn't put down our sunporch carpeting yet, so the cement floor was the perfect spot! 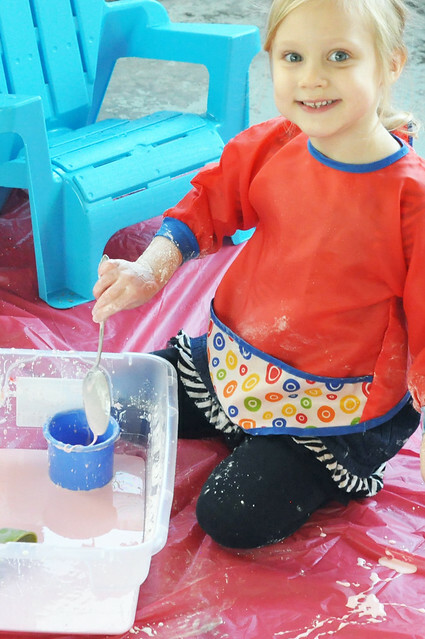 I told Lily to put on her smock and get ready to get messy! 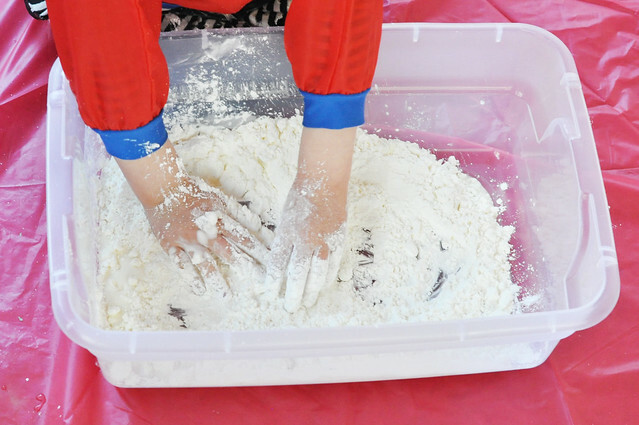 Pour the entire box of cornstarch into the container. Slowly pour water into the container in 1/4 cup increments. Some experiments call for 1 cup of water, some call for more. We used just over 1 1/2 cups of water. You want to do this slowly, and start mixing it together with your hands once you reach 1 cup. The desired consistency is that of honey or quicksand. Lily was disgusted by the feel of it at first, but soon got into it! 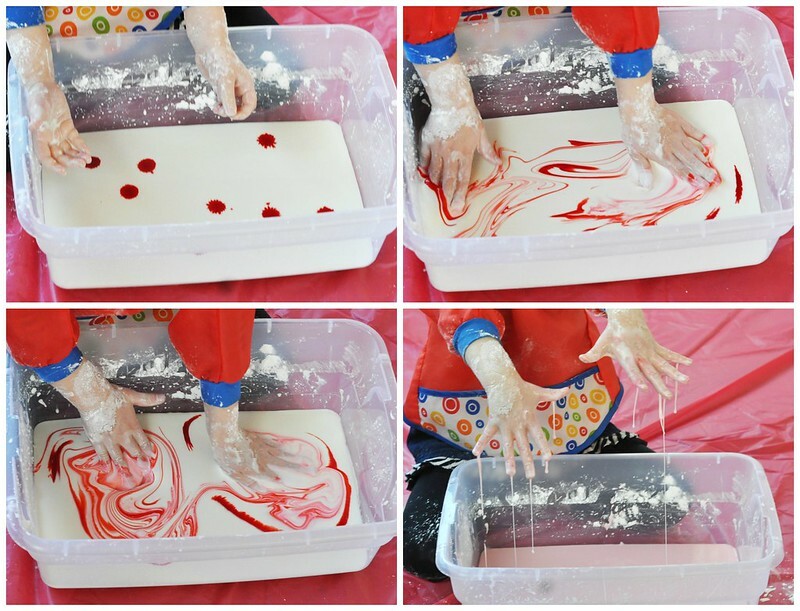 Add a few drops of food coloring, and start mixing it in! Lily, of course, chose pink, so we added a few drops of red! What makes Goop so fun is that it's really thick in the bottom of the container (almost like sludge), but as soon as you pick up handfuls of it, it becomes very runny! Lily thought it was so cool! 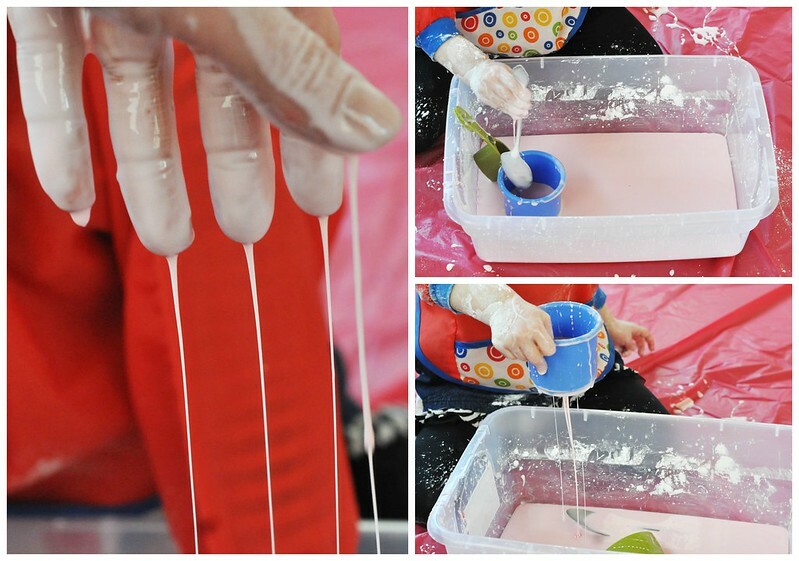 Goop is a fun sensory project for older toddlers and preschoolers, but it's also a great science experiment for older kids! Dylan and Lexie made it with me when they were younger, but as soon as they came home from school, they joined Lily. They were so fascinated by it and kept asking how it worked! It's definitely awesome to watch how it switches from a solid to a liquid, and goes back to a solid! The girls were a mess by the time they finished! Lexie ran off to change, but Lily needed to take a bath. Even though it looked like a huge mess, I promise you that cleanup is a breeze! 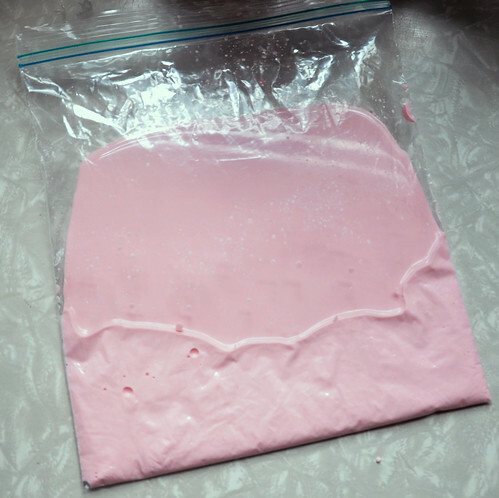 Before Lily ran off, we poured the Goop into a Ziploc bag and sealed it. If you are throwing the goop away, throw it away in the garbage. Don't wash it down the sink, because it could clog your drain!!! We put all the toys and utensils into the container, and rinsed everything off in the tub before Lily climbed in. The Goop immediately rinses off of everything, and doesn't leave any residue behind. It rinses easily off of kids, hair, and clothing, too!!! As for the tablecloth, I waited for the Goop to dry, then shook it off outside. Almost everything came off, and I was able to fold it up and put it aside for next time. The total cleanup time was well under 5 minutes! 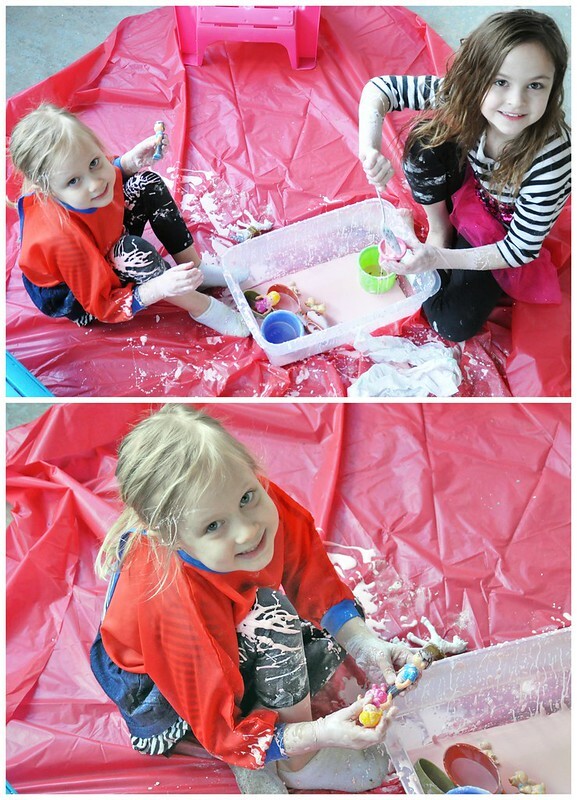 Our science experiment/sensory activity of the week was a huge success! We will definitely be making Goop again! It's quick and easy, and the kids love it! Goop is one of our favorites! I like playing with it just as much as the kids do! I'm sure they would! Trust me, it really is easy to clean up! Aaahhh! That is so much fun. 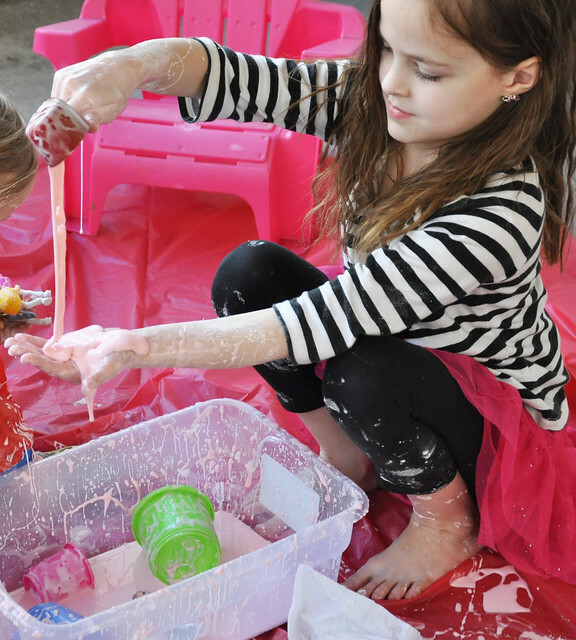 Messy fun is the best. You definitely have it down with the tarp outside. Don't wash it down your drain, noted! 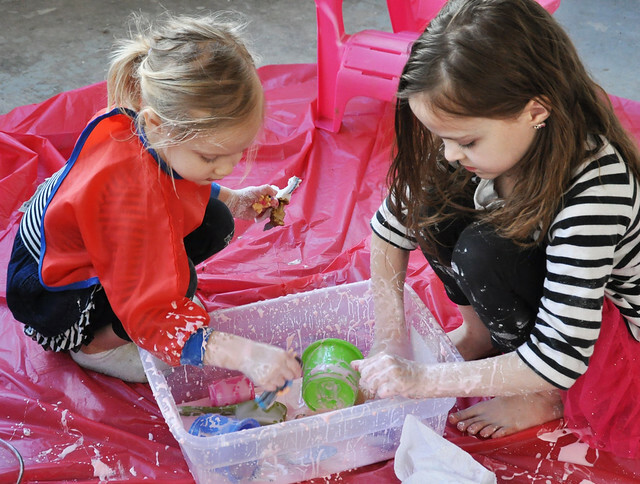 We could seriously use some good messy fun some day soon. You should give it a try. Preferably outside, haha!!! Keep it simple! There's no need for anything elaborate! How fun! I hear ya on the time. Haha! There isn't any free time!